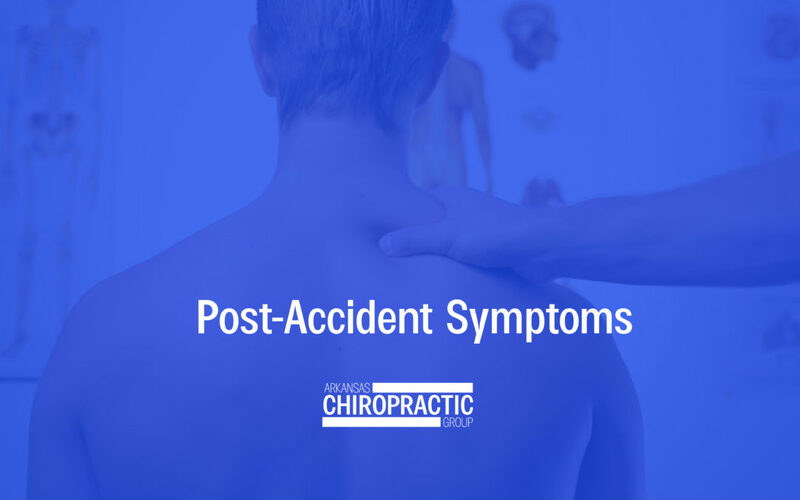 Have you recently been in an accident and are experiencing post-accident symptoms? Some patients may not be aware that it can take as long as 3-4 days after an accident for symptoms appear. Arkansas Chiropractic Group doctor, Olivia Fisher-Bickford, shares what you need to look for after a car accident. Have you been waking up and feeling like you can’t turn your head? Stiffness and pain in the neck is a very common post-accident symptom. A number of factors in the wreck can cause it including, whiplash, overextension of the neck, and blunt force impact. Our chiropractic specialists take time to really focus on the neck and get it back where it needs to be. Headaches are a very common post-accident-symptom. Whether they last an hour or an entire week, headaches can be debilitating and scary. Don’t waste any more time dealing with this issue. We can help make your headaches a thing of the past! Let’s be honest, lower back pain is just awful. It can be caused by just about anything but if you were recently in an accident there’s a good chance that the wreck is the source. Our chiropractic care can get your spine realigned and your lower back, free of pain. Experiencing numbness and tingling? Don’t panic. This is can be quite common after an accident. You can experience tingling down the arms, hands, fingers, legs, ankles, and knees. We have treatments specially designed to help you regain feeling and diminish tingling throughout your body. Car accidents are a very scary thing and having to deal with the post-accident symptoms just make it all even worse. Every single body responds to accidents differently, and symptoms can be more serious depending on your age. It is important to get in and get treatment as soon as possible to prevent symptoms from getting worse. Call our Arkansas Chiropractic location nearest you to make an appointment and start your journey to healing.